We were lucky enough to have a look around the Deanery CE Academy this week and thought we would share some photos showing the latest progress. Our thanks to Richard White at BAM Construction for showing us around and updating us on the works. The biggest change since we last visited was the introduction of the first internal walls. The building now feels much bigger, with the corridors and classrooms in place in the first wing (fronting on to Peglars Way). The science classrooms will be located on the top floor of this wing and it won't be long before all the services are in and the plastering can start. 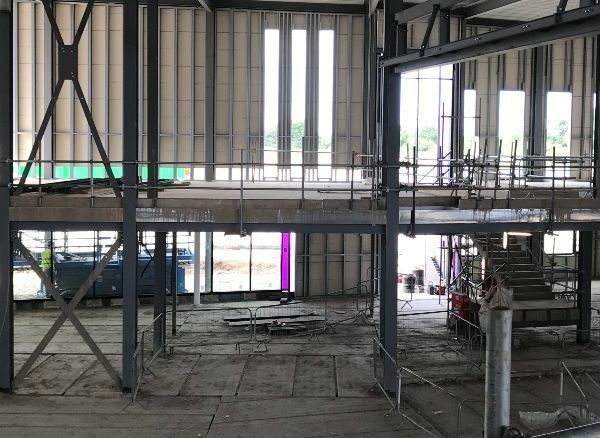 The structure of the sports hall is also in place, with its viewing platform which will allow spectators to watch sports matches. 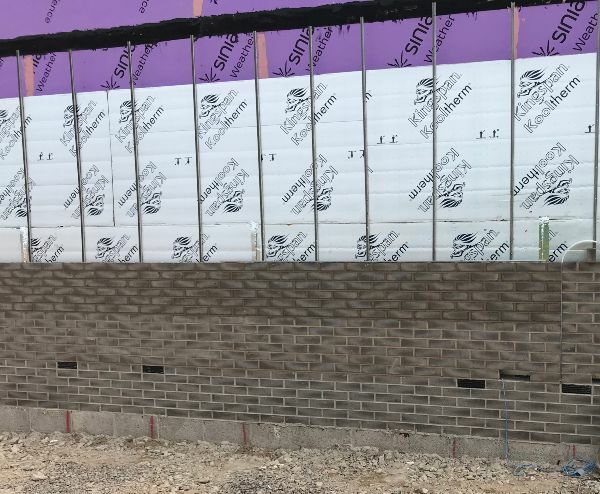 On the outside the brickwork is starting to be installed and the schools purple weatherproofing will slowly be covered up. The colour purple won't disappear completely as it is used in both the school logo and sections of coloured glass installed within the building, the first of which has just been installed. The first section of roof has been completed and will eventually be filled with PV panels to generate electricity which will help to power the school. Outside the building, the playing pitches have been laid, with the lines showing where the drainage has been installed to ensure the pitches can be used for as much of the year as possible. There's still a lot of work to be done, but the building is now starting to feel like a school and we are excited to see the works progress. The Deanery CE Academy is due to welcome its first pupils in September 2019. If you are interested in more information or registering your interest please visit the school's website.